In the latter half of the seventeenth century, Issac Newton solved the two-body problem and explained the motion of objects in the sky, solving a mystery that had haunted mankind from the beginning. How important was this? In the history of the intellectual development of the human race the first big step was when we came down out of the trees, the second was Newton's solution to the two-body problem, we're waiting for the third. Newton discovered gravity, discovered the laws of motion, developed calculus, and yet the hard work still lay before him. His goal was to explain the motion of objects in the sky. Kepler had proposed three laws of planetary motion, and had recorded a great amount of data that suggested that the laws did describe the motion of the planets in particular. However, Kepler had no idea why his laws held. Newton's goal was to explain Kepler's laws. He succeeded, and his efforts mark the beginnings of modern mathematics and physics. It's the most significant event in the history of our understanding of how the world works. And yet, here's a little bet for you, I'll bet that you cannot find a solution to the two-body problem in any book that is being used in any high school or university undergraduate course in math, physics, or engineering. Email me if I'm wrong. Note: the one-dimensional case is covered here. We will start by making a good assumption, that the sun and an orbiting planet can be represented by point masses, and that the force between them is given by Newton's law of gravity. We will also make an assumption that is not true, that the sun is 'fixed' in space and does not move. This second assumption simplifies the problem; after solving the simplified problem in this section, we will drop the assumption in the next section and solve the problem without it. The sun will be fixed at the origin of the coordinate frame. 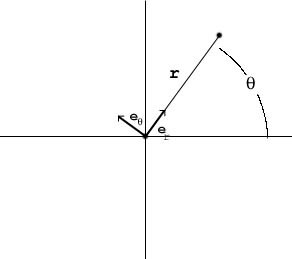 We will use polar coordinates to describe the planet's trajectory, r(t) and θ(t). Note: vectors are in bold type, so r(t) is the vector from the origin to the planet, and r(t) is the length of the vector. We'd like to be able to solve the DEs and write down the functions of time that describe the planet's orbit. That ain't happening. 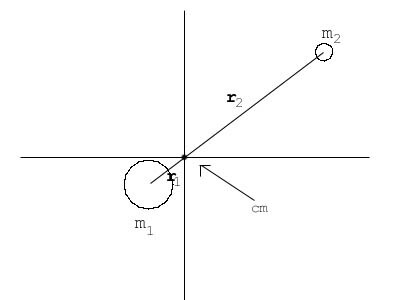 We have two coupled differential equation; one is non-linear. Non-linear equations are difficult; none of the techniques we've studied in CWT Vols 1 thru 4 apply to this problem. No analytic solution exists. Imagine Newton, after discovering gravity, the laws of motion, and calculus, finally writing down his first differential equation, and it's not solvable. Tough break! The problem of calculating the trajectory as a function of time is known as Kepler's problem, and it can be solved iteratively, see the reference at the bottom of the page. While a closed form solution is not possible, Newton was able to show that Kepler's laws could be derived from the equations of motion. We will content ourselves with showing that the orbit is an ellipse. r(t)2θ'(t) = h, a constant. r(t)θ'(t) is the tangential velocity of the planet, and mr(t)r(t)θ'(t) is the angular momentum of the planet. So this shows that the angular momentum of the planet is constant, corresponding to Kepler's second law. Et viola'. This shows that the planet's orbit is an ellipse (see last section). Given that the preceeding was the simplified version of the problem, some trepidation in proceeding to the unsimplified version is understandable. However, not to fear, all the work has been done. In reality, both the objects move. 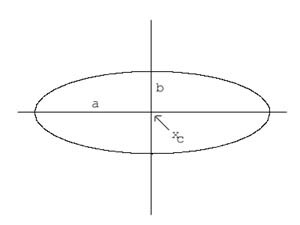 However, if no 'outside' forces are acting on the objects, their center of mass will be non-accelerating. We can use the center mass as the origin of the coordinates for the problem. Given these coordinates, a line from one object to the other will always pass through the origin. So, by using the value m23 /(m1 + m2)2 for the mass of the 2nd object, the problem is identical to the one solved in the previous section.